Mercury, the closest planet to the Sun, has only been visited by one spacecraft. This was Mariner 10 in 1974 - 75 and although this one mission transformed our understanding of this enigmatic world, the images and data returned raised more questions than they answered. In fact Mariner 10 was only able to image about half of the planet's surface during its flybys before it ran out of fuel and contact was lost. The data from Mariner revealed that Mercury has a magnetic field, had survived a near planet-shattering collision early in its history which had left it with a massive iron-nickel core and had been subsequently blitzed by a multitude of impacts and collisions, the shock waves of one of which are literally frozen into the planet's crust. Despite its wonders, Mercury has not yet been revisited, but now both NASA and ESA have unveiled plans to send a new generation of robotic explorers to the innermost planet. On August 3, 2004, NASA's MESSENGER probe (MErcury Surface, Space ENvironment, GEochemistry and Ranging) was launched into space. MESSENGER has an innovative, lightweight and comprehensive suite of scientific instruments that is studying the morphology, composition and structure of Mercury and its surrounding space. The yearlong science orbit began in March 2011. 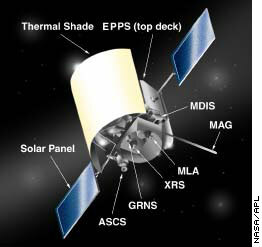 Some of the instruments aboard MESSENGER include imaging cameras (MDIS), various spectrometers for analytical studies (GRNS, ASCS and XRS) and instruments for studies of Mercury's geophysical environment (MAG, RS, EPPS) and morphology (MLA). These experiments are powered by specially designed solar panels that can withstand the extreme glare of the nearby sun whilst still producing electricity. Similarly, the whole spacecraft is protected by a lightweight sunscreen that keeps the science payload at a safe working temperature. One of the most innovative features of MESSENGER is the advanced onboard computers that have to be almost autonomous in operation, given that in certain situations the spacecraft will be out of direct contact with the Earth for up to 32 days when Mercury is on the far side of the sun. The flight to Mercury will took 5 years with multiple flybys of Venus and Mercury before the final Mercury orbital insertion burn. Such are the dynamical difficulties in sending a spacecraft from Earth to Mercury that 60% of MESSENGER's mass was simply the propellant to get the probe to its target. The mapping orbit around Mercury is steeply inclined with a closest approach of 500 km and an apogee of 15000 km, in part to assist in the thermal stability of the spacecraft. MESSENGER is the first spacecraft to arrive at Mercury for 30 years. ESA's BepiColombo mission is scheduled to launch in 2014 and makes its own way toward Mercury. BepiColombo, named after the Italian physicist who pioneered studies into the complex dynamics of Mercury's orbit around the sun and it's rotational period, is a much more complex and sophisticated mission than MESSENGER. The spacecraft has 3 major components, a planetary orbiter, a magnetospheric orbiter, and most interestingly, a surface lander in addition to 2 separate propulsion modules. The whole spacecraft will weigh 2.3 tonnes at liftoff, over twice that of MESSENGER and will require the power of an Ariane 5 rocket to boost it into space. Once on its way to Mercury, BepiColombo will then employ its innovative ion propulsion system, the SEPM. This uses a beam of xenon ions accelerated to very high speed by an electrical field to provide thrust. Although the total level of thrust is low, it can be applied continuously for an extended period resulting in significant acceleration. Using this engine, BepiColombo will reduce its flight time to Mercury to only 2.5 years, including flybys of both Venus and Mercury. Once the probe arrives at Mercury, the SEPM will be discarded and a standard chemical rocket motor will insert the spacecraft into orbit around the planet. Once in orbit, the spacecraft will start its year-long mission of mapping the surface of the planet and the surrounding space using a variety of sensors similar to those carried by MESSENGER. 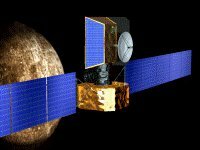 However, BepiColombo will also carry out some unique investigations of its own. Most spectacular of these will be a pair of surface lander/penetrators which will drop onto the Mercurian surface near the north pole of the planet, equipped with seismometers, analytical instruments and a camera. These will, assuming all works as planned, send back the first ever images and data from the surface of Mercury. The magnetospheric orbiter, built in conjunction with the Japanese ISAS agency, will be released into a highly elliptical orbit around Mercury, gathering data over a large part of the Mercurian magnetic field and studying its interaction with the solar wind. The planetary orbiter will be placed into a 400 x 1500 km polar orbit around the planet and will use a combination of unique design features and novel insulation materials to maintain its thermal stability. Ironically, after 30 years of waiting, these new missions to Mercury will provide such a wealth of data about the mysterious innermost planet that it will keep another generation of planetary scientists busy far into the future!